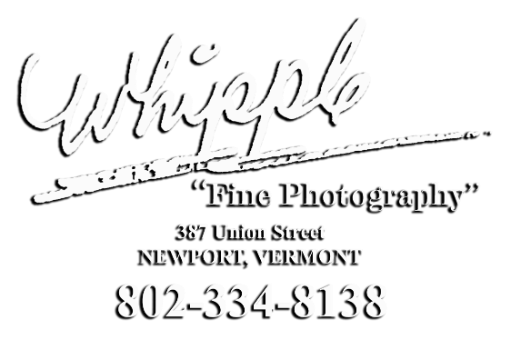 Thank you for wanting to know about me, Don R Whipple of Whipple’s Studio. For the Photography part of my life, read on, for my personal interest....skip down a bit. I have a Master of Photography Degree and the Photogenic Craftsman Degree, bestowed by the Professional Photographers of America as well and the "National" Award, the highest honor presented by the Professional Photographers of America. I have also been blessed to have received the Kodak Gallery Award, the Fuji Masterpiece Award and the "Vermont Best of Show" on numerous occasions. I love to photograph wedding events, portrait studies, high school senior portraits and numerous other interesting assignments throughout the year. In the fall you will find me and my staff traveling throughout Vermont and New Hampshire, providing school portraits to thousands of beaming students. Memberships include the Vermont Professional Photographers’ Association (VPP), the Professional Photographers of New England (PPANE), the Professional Photographers of America (PPA), the Wedding & Portrait Photographers International (WPPI) and the Photographic Marketing Association (PMA). My team is spectacular! Rhonda Cole has been with me for over 24 years, and provides outstanding customer service, arranging my schedule and ensuring that the work we deliver is stellar. Amy Patenaude has worked with me for over 20 years. She works mostly behind the scene, entering data for the thousands of students we photograph, providing customer service and operating our printing department seasonally. Christian Kerner has been with me for over 10 years. He is the graphic artist and is solely responsible for our complex printing and wholesale departments. Louise Whipple, my wife, works with quality control, packaging of school and sports, and retouching...lots and lots of retouching. Occasionally we are joined by a few others, especially in the fall....what a team. On a personal note, I love to cook, especially BBQ and with that I love to entertain....the more the merrier! With my wife, Louise, our daughter Sydney and son Jonathan, we ski, travel, hike, sail, and have as much fun living as we can fit in.